A few months ago, my clients at the U.S.G.S. contacted me for some interpretive signs at Magnuson Park. The topic was: Wet Labs. No, not those kind. (Although, with Seattle’s first Dog Swimming Beach, Magnuson Park has plenty of those, too). The U.S.G.S. 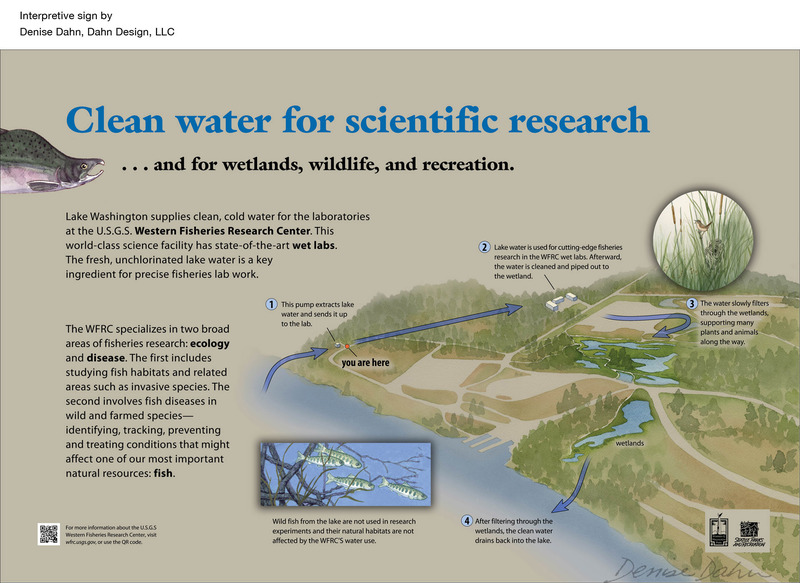 runs the Western Fisheries Research Center with state-of-the-art Wet Labs to study fish. The facility is located adjacent to the park, but part of their equipment is inside the park, so they wanted me to create 2 new signs to help visitors understand a bit about their work. The Center originated more than 70 years ago through the efforts of Dr. Frederick Fish, a visionary scientist who pioneered improved methods of studying Pacific Salmon. Here are the signs I wrote, designed and illustrated. They will be installed soon. This sign will be installed near a new pump station. The USGS figured park visitors would see the pump and wonder what it was, so they took the opportunity to educate them a little about their work at the Center. Seattle’s Magnuson Park was a pre-World War II era Naval Airfield and is now a huge complex of sports fields, tennis courts, trails, beaches, wetlands, and a Dog Swimming Beach. This sign will be installed near a reconstructed wetland complex which provides rich wildlife habitat. Cleaned and recycled water from the lab helps keep it wet year-round. If you visit Magnuson Park, watch out for the wet labs! Both kinds. 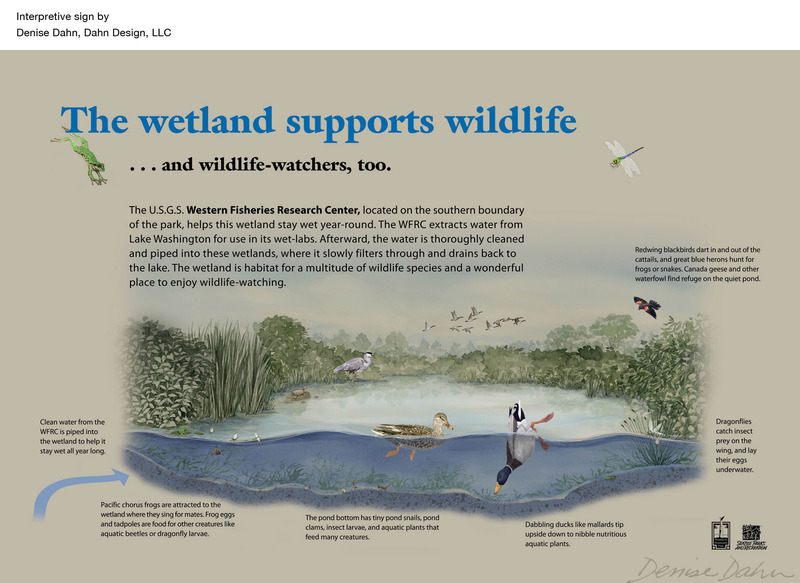 This entry was posted in Art and Writing, History and Culture, Recent Posts, The Natural World and tagged Dahn Design, interpretive sign, Magnuson Park, U.S.G.S., Western Fisheries Research Center, wetlands by dahndesign. Bookmark the permalink. I love it! 🙂 Gorgeous signs, too. I always talk about your work on my walks / hikes! What a fantastic job. I love the signs. I am a real junky when it comes to information on the environment. I really like what you have done. Thanks, Charlie! I’m glad to know people enjoy learning about nature. I enjoyed the piece on Seattle Trekker, too!